Our bulk discount personalized calendars have 12 exquisite, high resolution pictures, printed on top quality glossy paper. Choose from among 10 different models (click on titles): Furry Friends (Pets) , Fine Cuisine , Wildlife Paintings , Vintage Cars , World Travel , Wildlife Calendar , Erotica , Bikini , Automotive Girls , Natural Landscapes Calendar . 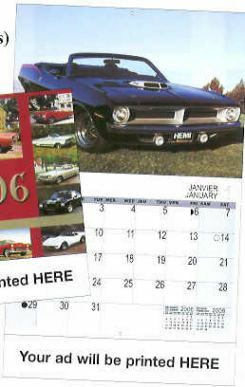 All calendars have bilingual dates (English and French). You may combine them at no cost, as long as you order minimum 50 of each model. NOTE: These are typical prices. Please check individual pages as some calendars may cost more.